Stefany Tomalin. 2016. Beads: A History and Collector’s Guide. Amberley Publishing: 96 pp., softbound $19.50. Those looking for a quick and fairly diverse introduction to bead collecting will find it in Stefany Tomalin’s book. Featuring good information, with representative examples and concise, insightful descriptions, this is a beginner’s guide that will take you through the most common categories of beads and their history in small, bite-size chapters. It’s an easy read, and Tomalin’s knowledge touches briefly on many subjects. For example, Egyptian faience is explained in a section on Ancient Egyptian beads, and their more modern simulacrums. A chapter on English lacemakers’ beads, contributed by Carole Morris, is a delightful if esoteric addition. The book is intended as a broad overview, and the layperson will emerge on the other side with a reliable understanding of the bead world. A few contemporary beadmakers are included, with local favorites Tom and Sage Holland, Tom Boylan and Art Seymour making an appearance, but the focus is on ethnographic and ancient beads. All told, there are twenty-seven chapters that each cover a different type of bead, or aspect of bead collecting. The longest chapter goes about thirteen pages, so these are quick to flip through. The beads shown are from Tomalin’s personal collection, and there are enough representative examples to give the reader a good idea of what’s actually out there. The photographs, while not quite coffee book material, are clear and easy to identify. Fakes, or as Tomalin gently suggests, “tributes,” are sometimes shown alongside the original artifact, helping to teach by comparison. If you are a bead aficionado who is searching for new research into dZi beads, this is not the book for you. However, for the rest of us, Tomalin’s tome contains a wealth of information. Did you know that avventurina is gold or brass-colored glass (more popularly known as goldstone), or that different tribes in Ghana each have their own proprietary beads that they make? How about the number of beads used in prayer strands and rosaries for various global religions? The world of the bead is vast indeed, and this book illustrates the interconnectedness of trade and craft that fueled a global enterprise. Sindi Schloss. 2018. Beads: A Reference and Price Guide. International Gemological Services: 174 pp., softbound $19.95. In terms of beads, we are in paradoxical times: never have so many scientists been studying beads, usually employing sophisticated technical equipment, as seen in the books on the facing page, while interest in beads, especially among hobbyists and collectors, is decreasing. At the same time, the number of bead publications is proliferating. Evident from the subtitle, this book is meant to serve as a reference and price guide, more for the general jewelry industry than specifically bead enthusiasts, although the latter group will certainly benefit. The author is a gemologist, with her own gemology school, an appraiser, a lecturer for a course on beads and was long associated with Gabrielle Liese’s now closed Arizona bead museums. Heavily illustrated, sometimes with unusual bead material, the book is sprinkled with summary charts of information, as well as tables that describe and list prices for beads likely to be encountered in the marketplace. Such price guides are appreciated by many but in a market that is undergoing rapid changes need to be used with caution. The twelve chapters define what makes a bead, with the bead lingo part describing both physical and production techniques. Five chapters are on bead sources: plants, terrestrial and marine animals, stones, metals, and glass. Another chapter functions like a bead dictionary, with names and descriptions in alphabetical order. Treated, altered and re-purposed beads, as well as reproductions and imitations are covered in two chapters. Uses of beads and jewelry, and an identification review/value determinants round out the balance of the chapters. References and index are included. There are a few errors of fact and misidentifications, but usually minor. Given the modest price and general usefulness of the contents, this book would be worthwhile for anyone who has an interest in jewelry, especially beads. One hopes that those who are attracted to personal adornment will be enlightened and consider beads as worthwhile both for wear and objects of historic, cultural and technical interest. Alok Kumar Kanungo, Editor. 2017. Stone Beads of South and Southeast Asia: Archaeology, Ethnography and Global Connections. Indian Institute of Technology Gandinagar and Aryan Books International: 444 pp., hardcover $66.00. This large format, well-printed and heavily illustrated volume is the result of a stone bead workshop held in 2015, organized by the editor. While most of the participants were from the Indian subcontinent, archaeologists from other Asian countries, Europe and the United States also were present, totaling ten countries and eighty attendees. Archaeological, ethnographic studies and the increasing importance of trade in antiquity of stone ornaments were addressed, with some degree of overlap among the articles. Because of the conservative nature of stone bead manufacturing, which is still ongoing in South Asia, it is possible to effectively compare ancient with historic and current production processes. With nondestructive elemental and isotopic analyses being extended to stone beads, this has lead to widespread application of these methods to provenance raw stone sources. The various authors cover from Neolithic Mehrgarh to present-day Khambhat, as well as stone beads used by the Nagas. Having written on various Naga tribes, I find this chapter short on content. Several chapters cover stone beads in historic literature. The most informative chapters are on processing of raw materials, production techniques, especially drilling, and ethnoarchaeological studies. Kenoyer’s chapter on the history of stone beads in South Asia serves as a good summary. The ample and usually well-photographed images provide excellent identification for most south and southeast Asian stone beads, as well as the source stones and minerals for these beads. Current techniques for compositional analyses of stones and methods of studying drilling processes will inform both scientists and bead enthusiasts on how so much more information can now be extracted from beads. Anyone working with stone beads will benefit from this compilation, especially archaeologists and serious students of beads. University and institutional libraries need to have this volume, which is a good value for the price. Elizabeth M. Foulds. 2017. 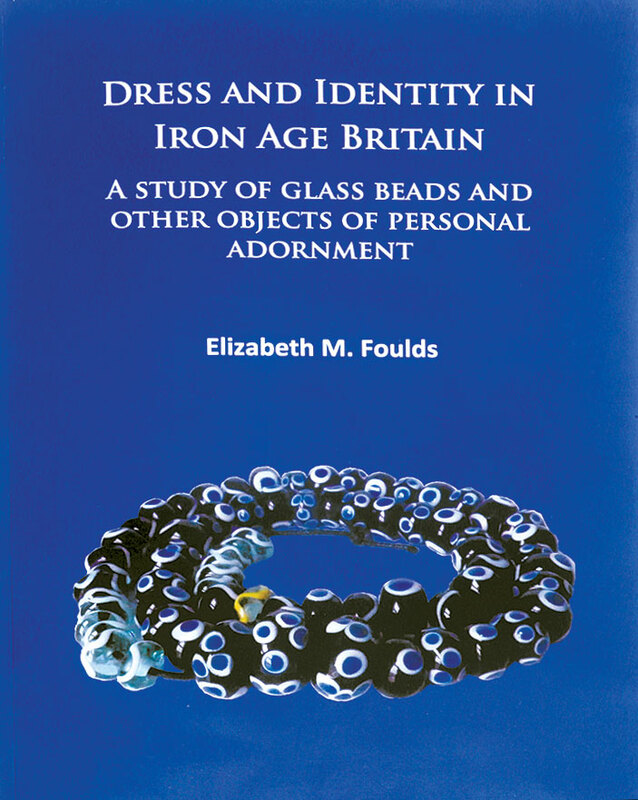 Dress and Identity in Iron Age Britain: A Study of Glass Beads and Other Objects of Personal Adornment. Archaeopress Publishing Ltd: 337 pp., softcover $50.00. Elizabeth Foulds attempts a very difficult task, that of trying to decipher how Iron Age (800 B.C. - A.D. 43) British inhabitants dressed, based largely upon Margaret Guido’s landmark study and catalog of British and Irish glass beads in 1978. While Guido provided a typology and classification for these some one thousand beads (1781? ), none of the samples were large and, surprisingly, many of these were elaborate and very well-made ring/annular and spherical beads. Such beads most likely would not have comprised an entire necklace, but were possibly used as accents, along with monochrome beads. Guido’s original data indicated some of the samples were from necklaces, but it is not clear if entire necklaces were included in her survey. To aid the author in how beads were used, Foulds also studied brooches, bracelets, finger rings, torques, and pins. A number of the chapters are detailed analyses of the distribution, find spots and characteristics of the beads as to shapes, sizes, glass color, decorative motifs, etc. In a comparison of glass beads found since the 1970s, she arrives at the conclusion that glass beads are scarce finds during the Iron Age, thus perhaps further validating the notion that such ornaments were luxury goods during that period. For those interested in how glass beads contributed to personal adornment, Chapter Eight is the most relevant. From the relatively scarce burials or inhumations, Foulds tries to determine possible necklace lengths and structures, as well as other uses of beads on the body, such as bracelets or anklets. From my limited exposure to reconstructed necklaces in the United Kingdom and continental museums, one of the dangers of using merely lengths of bead strands is that it does not take into consideration extant, ancient multistrand necklaces. The author’s study deals with the very important question of dress and adornment, in an environment where not much organic material survives. I am not certain that she accomplished her goal, but it was a worthwhile endeavor.